Disney's "final" fairytale (I use quotation marks because Tangled seems just as likely to be their final fairytale in the same way that the fourth Friday The 13th film was the "Final Chapter") looks at first glance to be the sort of smug, broad pandering tripe so often produced by DreamWorks, and anyone who has seen the trailer would be forgiven for thinking that was what it was. Yet in retelling the story of Rapunzel (Mandy Moore), it reveals itself to be a film that combines the best elements of classic Disney films - a touching, aching sincerity attached to well-drawn characters - and Enchanted - a wry, witty sense of humour which works for both adults and kids without alienating either. Rapunzel is a princess whose hair was imbued with magical healing powers when she was born, the result of a special healing flower that was used to stop her mother dying during the birth. When only a few days old, she was kidnapped by Gothel (Donna Murphy), an elderly witch who raised her as her own daughter, using her hair's properties to remain eternally young. Despite the claims of her 'mother' that the world outside is a dark and terrifying place, Rapunzel dreams of leaving her tower and seeing the wider world, particularly the strange lights that appear every year on her birthday. Her chance comes when Flynn Rider (Zachary Levi, most famous as the star of NBC's Chuck), a thief who has just made off with a valuable crown belonging to Rapunzel's real parents, hides out in her tower. 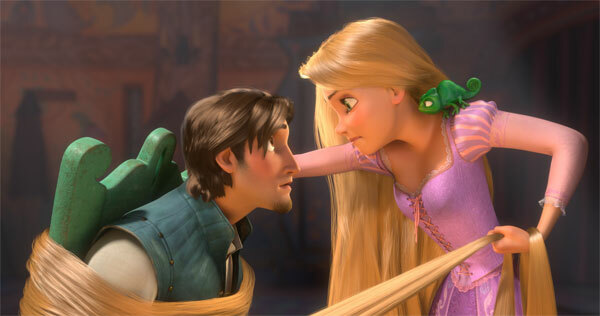 After knocking him out and hiding the crown, Rapunzel makes a deal with Flynn; she will give him the crown if he will take her out of the tower and act as her guide. With her 'mother', the king's troops and a horde of criminals in pursuit, Rapunzel and Flynn head out and, despite each being out for their own ends, they find themselves inextricably drawn together. Their subsequent journey is ripped straight out of the Disney playbook - moments of swashbuckling adventure interspersed with musical interludes and a sweet sentimentality - but is delivered with a wit and verve that sets it apart, as does its surprisingly complex depiction of the central mother-daughter relationship. Mandy Moore makes Rapunzel a charming but feisty heroine, the sort of Disney princess who is more than willing to take matters into her own hands - or hair, as the moment requires - whilst Zachary Levi is hilarious and affecting as Flynn, delivering some of the funniest lines (whilst swordfighting with a horse: "You should know that this is the strangest thing I've ever done!") as well as some of its more heartfelt moments. The animation is really quite stunning, too. Whilst being computer generated, it seeks to replicate the hand-drawn feel of classic Disney and gives a painterly feel to the backdrops. The result is a lush, textured world which also has the dynamism of computer animation. It's also the first film I've seen that genuinely justifies its use of 3D in an artistic sense (as opposed to Piranha 3D and Jackass 3D, which make good use of it as a gimmick). Admittedly, it only manages that in one scene - in which Rapunzel discovers that the lights in the sky are thousands of Chinese lanterns are let loose by her parents in the hope that she will see them and come home - but it is genuinely one of the most beautiful things I've seen in an animated film. The integration of modern animation techniques with a more classically influenced style sums up the tone of the film, too. Much like 2007's Enchanted, to which Tangled started out life as a sequel, there is an often biting wit that allows it to poke fun at the well-worn cliches of the fairytale. The film is often genuinely hilarious since, rather than relying on a bevy of pop culture references, it has clearly been written by people who understand the tradition to which they are paying irreverent homage. More than Enchanted, though, Tangled is willing to let the mask of humour fall every so often in order to engage with story. There is a warmth to the film and the relationship between Rapunzel and Flynn that is very touching, and it is made all the more affecting by the fine balance the film strikes between gently mocking its story and characters and openly embracing them. Though Tangled is not quite on a par with the great film of the Disney canon, if it turns out to be their last fairytale (and that is one big "if") it's a fitting coda that celebrates everything great about the studio in its own affectionate, clever and flippant way.